This paper verifies results in Broda and Weinstein (2005) and suggests a higher government revenue to GDP ratio than the results in their study is needed. 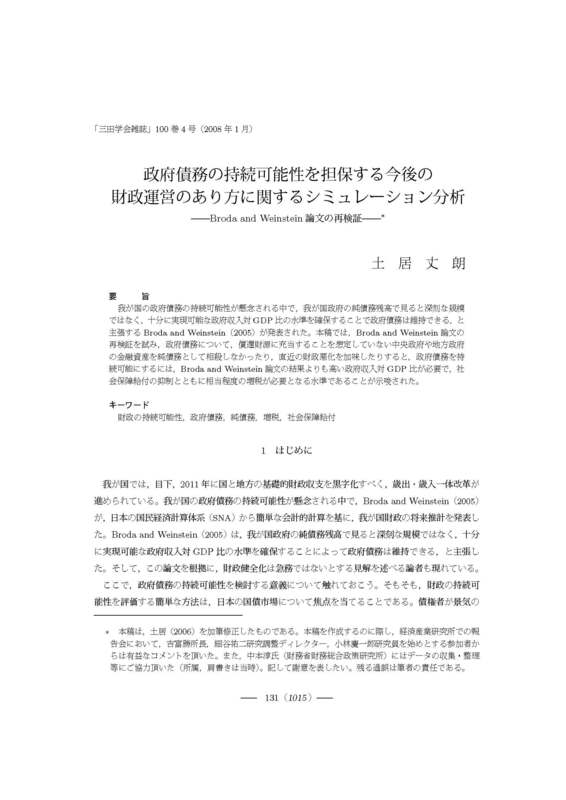 Under a situation wherein the sustainability of government debt in Japan is a concern, Broda and Weinstein argued that the Japanese government debt is sustainable by maintaining an achievable government revenue to GDP ratio, based on net debt basis. The results in this paper, however, means that in order to make the government's debt sustainable, a reduction of social security benefits and a considerable measure of tax increases are all necessary in the future. In the analyses in this paper, financial assets of central and local governments, which are not being considered by the government for use as repayment resources, have not been offset. Moreover, the fact that the fiscal situation has deteriorated further recently is given.